According to Dr. Paul Suren, folic acid is more than just an ingredient in your prenatal vitamin. Observational research shows taking folic acid (folate) supplements for four weeks prior to pregnancy and continuing for eight weeks after pregnancy reduces the risk of a child developing an autism disorder. The study was completed by the Norwegian Institute of Public Health and published in JAMA (Journal of the American Medical Association). Researchers investigated the findings of a sub-study of the Norwegian Mother and Child Cohort Study – the ABC (Autism Birth Cohort) Study. The autism cohort included more than 85,000 singletons born between 2002 to 2008. All infants were born at a minimum of 32 weeks gestation and weighed at least 5.5 pounds; age at follow-up ranges from three to 10 years with an average age of 6.4 years. Data was collected using questionnaires, medical referrals and patient databases. 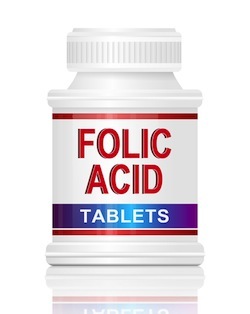 About 71% of women used folic acid before and after conception. At follow-up, 270 disorders were noted – 114 autism, 100 PDD-NOS and 56 Asperger syndrome. When contributing factors were taken into consideration, folic acid intake only affected the number of autism disorders, not Asperger syndrome or PDD-NOS cases. Women of higher socioeconomic status where maternal health concerns were met by health-conscious women were more likely to supplement with folic acid. Current folic acid intake guidelines suggest 400 mcg of folic acid daily prior to pregnancy and throughout pregnancy. However, these guidelines do not mention when women are supposed to start taking folic acid prior to pregnancy. Based on this study, women could start taking folic acid at least four weeks before attempting to conceive. Over the counter prenatal vitamins contain the recommended daily intake of 400 mcg. Source: Surén P, et al "Association between maternal use of folic acid supplements and risk of autism spectrum disorders in children" JAMA 2013; 309: 570-577. Berry R, et al "Periconceptional folic acid and risk of autism spectrum disorders" JAMA 2013; 309: 611-613.